Villa Bordoni is one of the most beautiful spots in Chianti Classico. Set in the hills outside Greve, this small, family run hotel/restaurant is an oasis of tranquility and understated elegance. Scots David and Catherine Gardner are charming, welcoming hosts full of enthusiasm for the region and all it has to offer. I have eaten at Villa Bordoni several times over the last few years, but two recent meals were particularly of note. Readers will have to brave unpaved roads to get to Villa Bordoni, but there are plenty of signs to help guide the way. Villa Bordoni has a fairly extensive wine list for a small, cozy restaurant. Given the uneven storage conditions in Tuscany’s restaurants I have decided to stop ordering expensive wines at dinner and now focus only on current releases. The strength of recent vintages in Chianti Classico ensures that is not much of a problem. 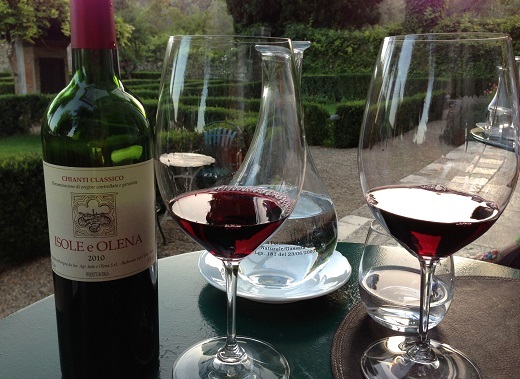 We went through two bottles of Isole e Olena’s 2010 Chianti Classico, but could have easily finished a few more. The wine is that delicious. Fresh, perfumed and vibrant, with plenty of that vintage’s trademark bright acidity, the 2010 is flat-out great. What a wine! 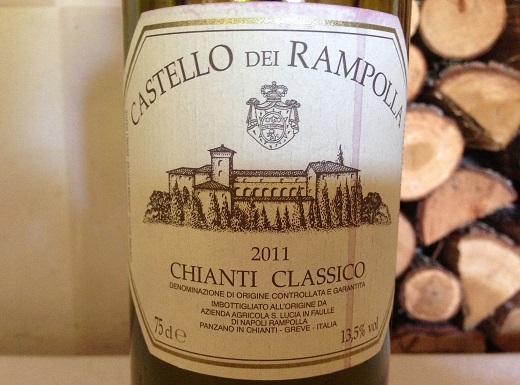 Castello dei Rampolla’s 2011 Chianti Classico captures both the richness of the year and the textured style that is the hallmark of the Rampolla wines. Here the fruit is dark, sensual and beautifully layered. The more voluptuous side of Sangiovese comes through in spades. Both wines are superb, but also distinct, which only serves to highlight the differences within Chianti Classico. 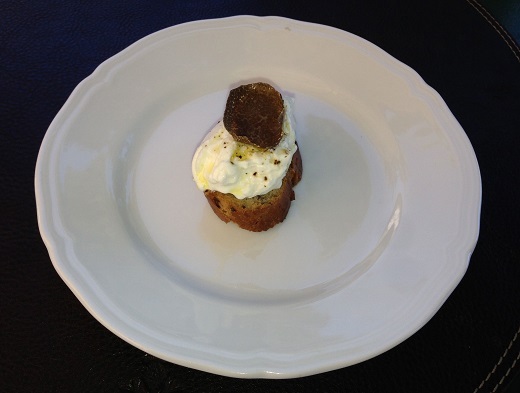 Is there a better way to start lunch than with crostini topped with burrata, a drizzle of olive oil and summer truffles? I doubt it. All of our dishes are fabulous, and I tried several of them more than once. 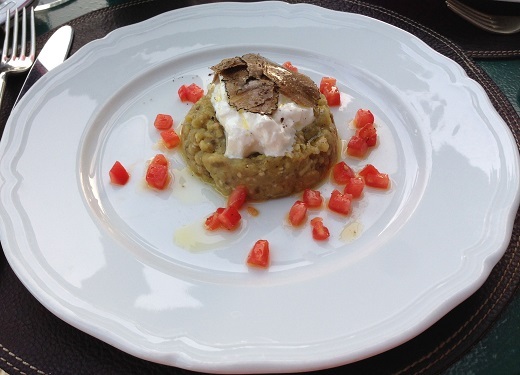 The smoked eggplant with burrata and fresh truffles, served chilled, is actually quite refreshing and light. 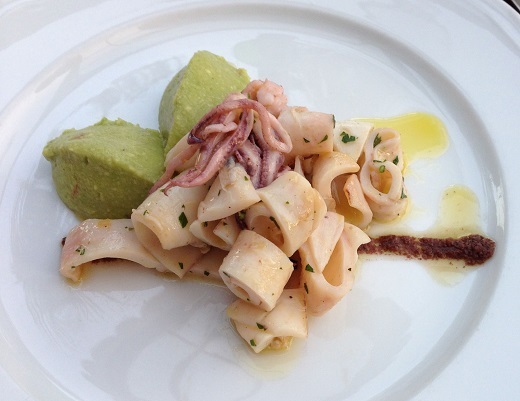 Villa Bordoni’s calamari and avocado salad with taggiasche olive sauce is a nice break from the standard Tuscan fare. The flavors are bright and beautifully articulated. Our pasta dishes are both a bit more typical. The taglierini with porcini mushrooms is a delicious take on a standard, and a fabulous pairing with Sangiovese. I also adore the spaghetti alla chitarra with bufala mozzarella and cherry tomatoes, a perfect, light dish for the summer. A bite of the spaghetti followed by a taste of Isole e Olena’s 2010 Chianti Classico is simple yet deeply satisfying to the core. 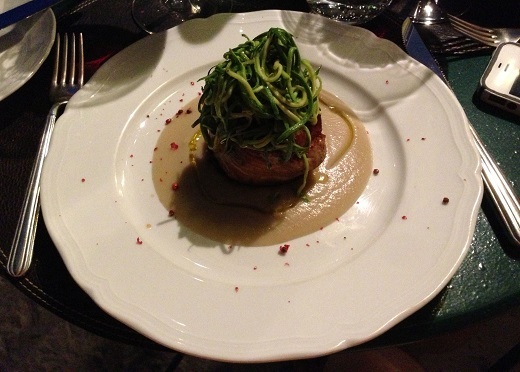 The pork filet is an absolutely divine marriage of perfectly cooked meat, bacon and summer vegetables. I would gladly order it again. 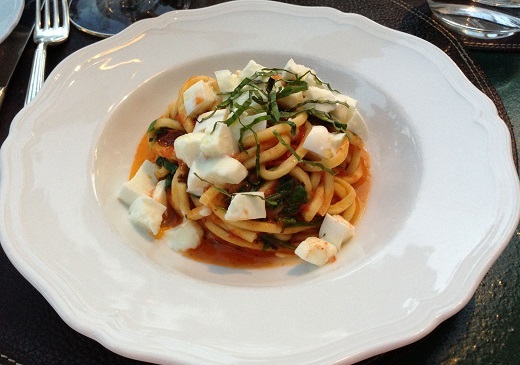 It may seem hard to believe, but finding great places to eat in Chianti Classico is not easy. Most restaurants fall into one of two categories; they are either tourist traps, or they try to be high-end, formal and elegant, a style of dining Italy simply doesn’t do well, with maybe a few exceptions. Villa Bordoni is the real deal. The food is ingredient-driven, simple and beautifully executed, all presented in a gorgeous, welcoming setting. What else can you ask for?